PRODUCT DESCRIPTION: QuikPRO – Powered by Roundup® Technology – is the latest and greatest in the turf and ornamental herbicide line-up from Monsanto. With QuikPRO there is simply no better choice for immediate, visible results and unsurpassed weed control. 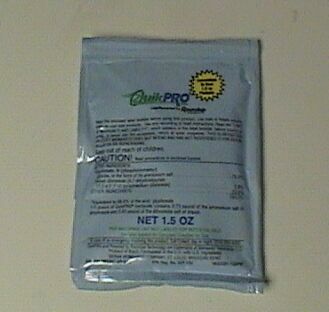 QuikPRO provides: * Quick Measuring (Premeasured Packets) * Quick Mixing * Quick Action * Quick Results. WHERE TO USE IT: Trim and Edge, Brush and Vines, Shrub and Flower Beds, Tree Rings and weed control in dormant Bermuda Grass. RATE OF APPLICATION: 1.5 oz pack per gallon of water. Spray until plant in wet, but not to run off. Use Turf Mark to identify were applications have been made. Drift Guard is also recommended to keep product off of non target plants. A gallon of water can treat 250+ sq/ft.